KUALA LUMPUR, 1 July 2015 – The Bank Rakyat Foundation (BRF) intends to showcase sustainable development on an island at peninsular Malaysia’s east coast with the expertise of The National University of Malaysia (UKM). Chairman of the BRF Board of Trustees, Dr. Roselan Baki said the foundation is confident that UKM can help set up an ecovillage that would be a model of sustainable development with environmental protection. Dr Roselan was speaking to reporters here after the signing of a memorandum of understanding (MoU) here on June 26th between BRF and UKM along with five other partners for the promotion of education programmes as well as extending education opportunities to students and interested professionals. Dr Roselan said he is quite satisfied with UKM’s Institute for Environment and Development (Lestari) in research and training for BRF staff at various projects, including collaboration in Langkawi. Declining to name the island, he said BDF decided that it wanted Lestari to provide the scientists and researchers for the island project, just as it had succesfully implemented several other programmes with UKM. Among those projects were Sustainable Community Series II programme, involving a total of 45 secondary school students selected in Langkawi. Students learnt through a module about the theoretical and practical aspects about forests, water, soil and effluents. Lestari Senior Fellow Dato’ Shaharuddin Mohd Ismail said UKM and BRF are the co-sponsors of the Forest Discovery programme at Langkawi which raises awareness among youths about the country’s oldest heritage – the tropical rain forests. He explained that BRF is sponsoring their collaboration on the programme dubbed Ecosystem Discovery Journey aimed at students and teachers of a school in Pulau Tuba, Langkawi at a cost of RM100,000 . 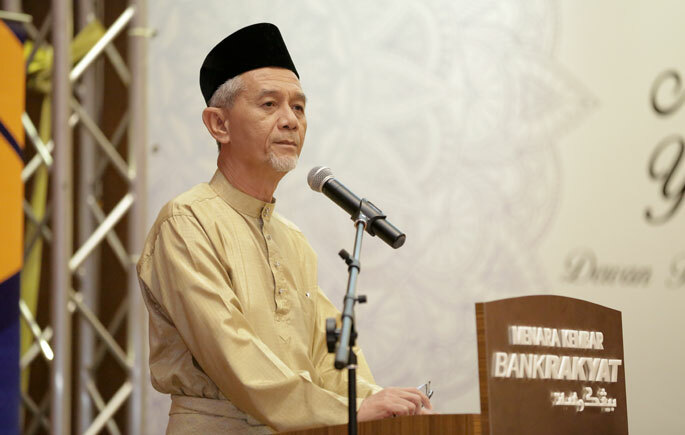 Shaharuddin said the objectives are to introduce an environmental education module to primary and secondary students and to form a team of so-called EcoVolunteers from among those students. Shahruddin – who is also Head of the Core Groups of Water, Forests and Natural Resources – said they also brought together students and researchers in the Ecovolunteer Club activities such as kayaking and cycling starting from UKM campus, Tanjung Karang, Teluk Intan, Tanjung malim and back to Bangi. At the MoU signing, UKM was represented by Deputy Vice-Chancellor (Research and Innovation) Prof Datuk Dr Mazlin Mokhtar while Lestari director Prof Dr Raihan Tahar stood by as witness. 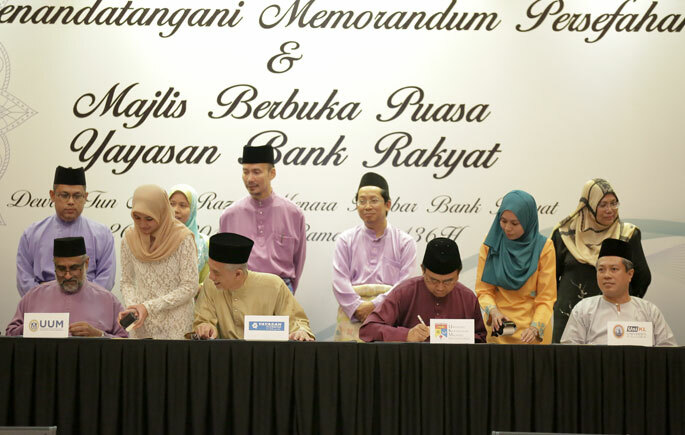 Norashikin Shaharudin, General Manager for Bank Rakyat signed for the foundation while witnessed by Dr. Roselan. In his speech, Dr. Roselan said the cooperation between government agencies, corporate sector and institutions of higher education will help to improve the standard of education in the country through education sponsorship as well as convertible loans to deserving students. The other parties were Berita Harian (BH), Universiti Kuala Lumpur (UniKL), Universiti Utara Malaysia (UUM), Putra Business School (PBS), the Manpower Department (JTM) and KRU Academy. In conjunction with this MoU signing BRF took the opportunity to hold a breaking of fast for about 150 invited guests.